Spread across 35 acres of verdant terrain and set against the legendary Banasura hills, the resort is a complex of earth rooms, twin villas and suites. Cement constitutes only 5 percent of the buildings and the rest is the mud abundantly available there besides locally resourced degradable materials. India’s tourism superbrand has recently embarked on a major initiative on sustainable tourism and this resort can rightly claim to be a trailblazer and a strong answer to the concrete jungles being erected in Kerala’s tourist hotspots like Munnar causing large scale environmental destruction. “The basic concept is there should be no damage to the environment in any manner. Whatever material we use for construction should return to earth after their lifecycle without damaging the eco system,” said renowned architect Eugene Pandala. This is a brainchild of Pandala, who holds his masters in urban design from School of Planning and Architecture, New Delhi. He has pioneered the state’s two major heritage conservation projects of Fort Cochin in the port city of Kochi and East Fort located in the state capital Thiruvananthapuram. According to him, mud is energy-friendly, safe, recyclable and economical. There is no smell of synthetics, no sound of mechanical systems and no rattling when the wind roars. It simply is a constructed environment that grows from the earth, yet remains as a natural, sustainable environment. A fellow in heritage conservation at the University of York and Fort Brockhurst English Heritage Training Centre in UK, he was the founding head of the department of architecture at the Architecture School in Quilon, Kerala, where he spent educating and researching on traditional building technologies of India. While studying in New Delhi, Pandala met Hassan Fathy and he was heavily influenced and inspired by the legendary architect and author of Architecture for the Poor: An Experiment in Rural Egypt who pioneered sustainable architecture in Egypt. Pandala has constructed several mud houses over the years but this is for the first time that a tourism entrepreneur comes forward to tap its potential in line with the state’s policy of sustainable tourism and it was an instant hit. His notable mud buildings include a 13,000 sq ft studio that has a sound-proof room. He says his concept is not something new. Part of the Great Wall of China was built of rammed earth and stone in 246 BC and the biggest earthen building is a world heritage site, the Dejenne Mosque in Mali, which can seat 3,000 people. The Kerala capital also has more than 100-year-old mud buildings still intact. The Banasura Sagar Dam overlooking this resort is also built up of mud and it is India’s largest earthen dam and Asia’s second largest. Built in 1979, the dam is also a major tourist attraction in the region and that also forms part of the resort’s theme. Pandala was here before, to build the tomb of the legendary warrior King Pazhassi Raja, who employed the guerrilla warfare against the British from these hill forests. The tomb, a mud structure built for the Kerala Government, is situated at Mananthavady on the way to the resort. According to Pandala, almost 50 percent of the people all over the world live in houses made out of mud and mud was the major construction material till the beginning of 20th century in Kerala as well. Pandala does not prefer geometrical shapes and his buildings have flowing, curvaceous shapes which is evident here too. He prefers to have lighter roofs that will not be a burden for the walls. 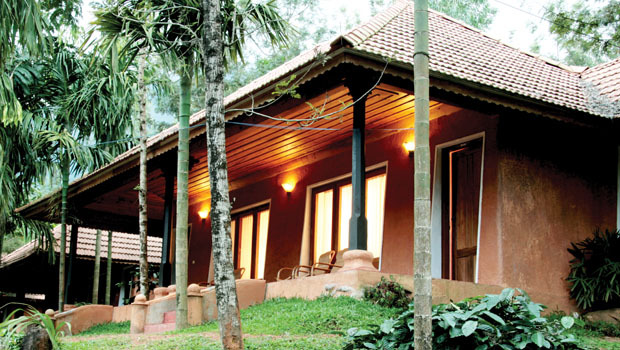 The concept of Banasura resort is unique in many ways. No air-conditioners are needed as the mud wall act as an effective regulator of heat and cold. And there is a sprightly stream flowing through the property. The main building of the resort with a plinth area of 20,000 sq ft is a massive two-story structure made entirely of mud with a roof of bamboo and coconut palm fronds. All the 31 spacious rooms, villas and suites are tastefully furnished. A multi-cuisine restaurant, coffee shop, conference hall, ayurveda spa, library, playing area and gym are awaiting the guests within the muddy walls. Rooms have modern bathrooms, terracotta flooring with wooden floors around the bed. Recycled wood is used for much of the woodwork and periodic anti-termite treatment is done using cashew-shell oil rather than chemical agents. Natural light is exploited to the fullest while CFL lamps provide extra lighting minimizing energy consumption. A bio-gas plant recycles organic waste and fires the resort’s kitchens. The only handicap of this resort is that it’s a bit unfriendly to the disabled and the elderly like all similar structures built by Laurie Baker, the British-born Indian architect considered the guru of cost-effective and energy-efficient architecture, and his disciples in Kerala. Pandala employs rammed earth technique. Only three-foot high walls can be made in a day and it must dry before the next portion is made over it and that way the labor involvement is much high. It is a time consuming process too. Mud is non-toxic, non-allergic, rot and termite proof, controls humidity and offers great sound isolation. These structures can balance fluctuations in temperature throughout the year. “We initially planned to build the resort for our executives in Indian and abroad to unwind but decided to tap its commercial potential as the enquiries swelled,” said Shankar Thiruvillakkat, Advanced Software Services Inc (ASSYST), a US-based software development company with its strategic support facility based in Kochi, which owns the resort. The nearest airport and railway station is three hours’ drive away in Kozhikode. You’ll be greeted by swinging monkeys at the hairpin bends (there are nine) as you wind your way up through the 14-km long mountain pass through the canopy of tree branches amidst the misty hills. At the resort, your hosts, Manager Rajesh and his assistant Swapna, will greet you. Guests are welcomed with a drink. As soon as you reach there, you can take an ayurvedic rejuvenation therapy that would help you beat the jetlag or go to the restaurant after freshening up. The traditional Kerala cuisine, smothering spices which Wayanad is famous for forming part of it, is the highlight of the multi-cuisine restaurant. You can savor the delicacies occasionally taking a peep at a breathtaking view of the surrounding landscape. The resort has a 50-seat conference hall equipped with computers, projectors and a public address system. Resorts these days offer such facilities as Kerala, India’s tourism hotspot, is fast becoming a destination for meetings, incentives, conferences and exhibitions as well. Adjacent to this is a cozy reading room where you can browse through newspapers, magazines and a large collection of popular children’s titles (to keep the family’s decision-makers happy) over a cup of coffee made of crushed seeds straight from the fields. The Ayurvedic spa where an excellent package of rejuvenation therapy is available is another attraction. On offer here are massages using herbal oil for the body, face and head then an herbal steam bath would follow. You can also take a guided trekking to the forests (some 26 percent of is dense forests which is the habitat of an incredible variety of flora and fauna) or visit the historical and religious monuments (Muslims, Christians and Hindus live in harmony here). Visiting Banasura hill, Pookote Lake, Meenmutty waterfalls, Kuruva island, Soochipara Kanthanpara waterfall, Chembra peak, Begur wildlife sanctuary, Tholpetty wildlife sanctuary and Muthanga wildlife reserve are some of the options. Or you can visit the tribal hamlets at the foot of the Banasura hill which has been in existence for centuries.